Most everything under the sun, even the occasional podcast. Pizza…oh, wait, that’s for after the run. Gatorade is good, but it’s not a food…I’d have to go with Clif Bars. Mostly alone, sometimes with others. Mostly non-fiction, best recent read: “Manhunt: The 12 Day Search for Lincoln’s Killer” by James Swanson. Still have hopes of breaking 2:45 in the marathon and 1:17 in the half marathon. Because there is no better form of therapy, and it’s cheap. My best marathon memory does not involve one that I have run, but rather my coaching experience in 2004 when I lived in St. Louis. I was one of the coaches through the local YMCA for a group of about a dozen marathoners preparing for the St. Louis marathon. Most were first timers; some had never run more than a couple of miles. Through wind, rain, snow and perseverance, all finished. I learned that imparting knowledge to others through one’s own experience is powerful medicine indeed. Having run marathons for 13 years, I like to think I have learned a thing or two about running. It’s my chance to pass this on to others who are part of the “marathon family”. 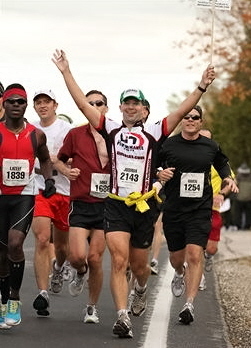 Kentucky Derby Marathon, Louisville, KY, 2007 – Pacing 3:30 on a warm spring day, I caught a gentleman (professor at Purdue) running his first marathon. 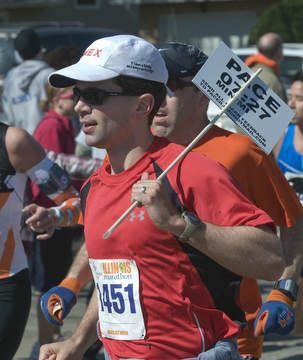 He was hurting, and I kept providing encouragement, telling him to stick with me and cross the finish line together. He was in a rather negative state of mind, but he ran right beside me. 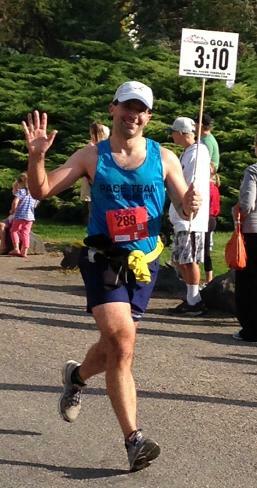 Finished right under 3:30, and he couldn’t have been more ecstatic. Striving together toward a common goal is tremendous motivation by itself. I’ll never be the fastest runner, but I know there is one thing in running I can do and do well is hold a pace. That, and the corny jokes.